Try our Genuine Iron Nickel Meteorites Satisfaction Guarantee - compare our prices and our superior quality. Click on any natural iron nickel meteorite image below to enlarge it. Gibeon Meteorite Dimensions: 3.5" x 2.2 x 1.8"
This genuine Gibeon individual meteorite has all natural surfaces with some very well formed thumb-prints or regmaglypts which were produced by intense heat and ablation as it passed into and through earth's atmosphere. The surfaces are in very good condition. This natural Gibeon meteorite was discovered at the Gibeon meteorite field in Great Namaland, Namibia. Gibeon meteorites are classified as fine octahedrites, type IVA. 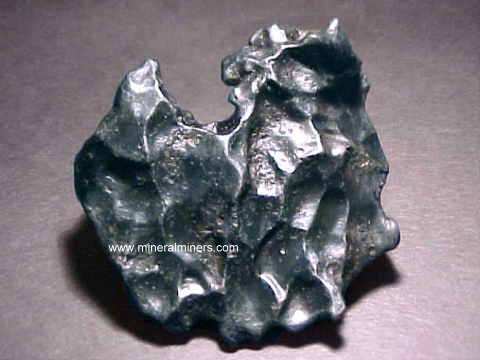 Gibeon meteorites are composed entirely of the two crystalline iron-nickel mineral varieties taenite and kamacite. The chemistry of Gibeon meteorites is approximately 91% iron, 8% nickel, 0.5% cobalt, 0.04% phosphorous, along with trace amounts of gallium, germanium and iridium. Gibeon meteorites display beautiful designs known as Widmanstatten patterns when the surface is etched. These patterns show the intergrown crystalline structure of the taenite and kamacite. Gibeon Meteorite Dimensions: 7.6" x 4.2 x 2.2"
This genuine Gibeon individual meteorite has a relatively flat shape with all natural surfaces showing some very deep thumb-prints or regmaglypts on each side which were produced by intense heat and ablation as it passed into and through earth's atmosphere. See another view which better shows one of these deep impressions on surface of this natural Gibeon meteorite. The surfaces are in very good condition. This natural Gibeon meteorite was discovered at the Gibeon meteorite field in Great Namaland, Namibia. See also an opposite side view of this natural Gibeon meteorite. Gibeon meteorites are classified as fine octahedrites, type IVA. 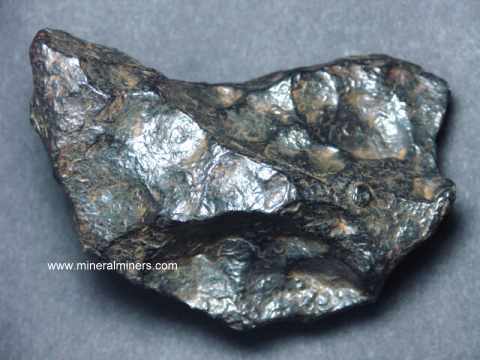 Gibeon meteorites are composed entirely of the two crystalline iron-nickel mineral varieties taenite and kamacite. The chemistry of Gibeon meteorites is approximately 91% iron, 8% nickel, 0.5% cobalt, 0.04% phosphorous, along with trace amounts of gallium, germanium and iridium. Gibeon meteorites display beautiful designs known as Widmanstatten patterns when the surface is etched. These patterns show the intergrown crystalline structure of the taenite and kamacite. Campo Del Cielo Meteorite Dimensions: 5" x 3.1" x 2.1"
The surfaces of this Campo Del Cielo meteorite have thumb-prints or regmaglypts which were produced by intense heat and ablation as it passed into and through earth's atmosphere. This individual Campo Del Cielo meteorite specimen is classified as a coarse iron octahedrite, type IAB. The Campo Del Cielo meteorite fall occured between 4000 and 6000 years ago. The first record of its discovery was in 1576 by a Spanish Captain named Miravel, although the actual meteorite fall is believed to have been witnessed by local Indians who originally named this region the "field of heaven". Campo Del Cielo Meteorite Dimensions: 4.2" x 3.2" x 2.5"
Campo Del Cielo Meteorite Dimensions: 5.3" x 4.5" x 2.6"
The surfaces of this Campo Del Cielo meteorite have thumb-prints or regmaglypts which were produced by intense heat and ablation as it passed into and through earth's atmosphere. See also an opposite side view of this natural Campo Del Cielo meteorite. This individual Campo Del Cielo meteorite specimen is classified as a coarse iron octahedrite, type IAB. The Campo Del Cielo meteorite fall occured between 4000 and 6000 years ago. The first record of its discovery was in 1576 by a Spanish Captain named Miravel, although the actual meteorite fall is believed to have been witnessed by local Indians who originally named this region the "field of heaven". Campo Del Cielo Meteorite Dimensions: 5" x 3.5" x 3"
The surfaces of this fine quality Campo Del Cielo meteorite have thumb-prints or regmaglypts which were produced by intense heat and ablation as it passed into and through earth's atmosphere. This individual Campo Del Cielo meteorite specimen is classified as a coarse iron octahedrite, type IAB. The Campo Del Cielo meteorite fall occured between 4000 and 6000 years ago. The first record of its discovery was in 1576 by a Spanish Captain named Miravel, although the actual meteorite fall is believed to have been witnessed by local Indians who originally named this region the "field of heaven". Campo Del Cielo Meteorite Dimensions: 5.4" x 5" x 2.6"
The surfaces of this Campo Del Cielo meteorite have very interesting thumb-prints or regmaglypts which were produced by intense heat and ablation as it passed into and through earth's atmosphere. This individual Campo Del Cielo meteorite specimen is classified as a coarse iron octahedrite, type IAB. The Campo Del Cielo meteorite fall occured between 4000 and 6000 years ago. The first record of its discovery was in 1576 by a Spanish Captain named Miravel, although the actual meteorite fall is believed to have been witnessed by local Indians who originally named this region the "field of heaven". Campo Del Cielo Meteorite Dimensions: 6.5" x 3.8" x 3.7"
The surfaces of this superb Campo Del Cielo meteorite are covered with thumb-prints or regmaglypts which were produced by intense heat and ablation as it passed into and through earth's atmosphere. See also an opposite side view of this natural Campo Del Cielo meteorite. This individual Campo Del Cielo meteorite specimen is classified as a coarse iron octahedrite, type IAB. The Campo Del Cielo meteorite fall occured between 4000 and 6000 years ago. The first record of its discovery was in 1576 by a Spanish Captain named Miravel, although the actual meteorite fall is believed to have been witnessed by local Indians who originally named this region the "field of heaven". Campo Del Cielo Meteorite Dimensions: 6.5" x 5.5" x 2.9"
The surfaces of this fantastic Campo Del Cielo meteorite are covered with thumb-prints or regmaglypts which were produced by intense heat and ablation as it passed into and through earth's atmosphere. See also an opposite side view of this natural Campo Del Cielo meteorite. This individual Campo Del Cielo meteorite specimen is classified as a coarse iron octahedrite, type IAB. The Campo Del Cielo meteorite fall occured between 4000 and 6000 years ago. The first record of its discovery was in 1576 by a Spanish Captain named Miravel, although the actual meteorite fall is believed to have been witnessed by local Indians who originally named this region the "field of heaven". Campo Del Cielo Meteorite Dimensions: 8.5" x 5.7" x 3.5"
This large Campo Del Cielo meteorite has a very desirable shape and stands up in the position shown. Its surfaces show thumb-prints or regmaglypts which were produced by intense heat and ablation as it passed into and through earth's atmosphere. See also an opposite side view of this natural Campo Del Cielo meteorite. This individual Campo Del Cielo meteorite specimen is classified as a coarse iron octahedrite, type IAB. The Campo Del Cielo meteorite fall occured between 4000 and 6000 years ago. The first record of its discovery was in 1576 by a Spanish Captain named Miravel, although the actual meteorite fall is believed to have been witnessed by local Indians who originally named this region the "field of heaven". 1.5" x 1.2" x 0.9"
This individual Sikhote-Alin iron meteorite has thumb-prints (also known as regmaglypts; cavities on the meteorite's surface produced by intense heat and ablation as it passed into and through earth's atmosphere) all over its surfaces. See also an opposite side view of this natural Sikhote-Alin meteorite. The Sikhote-Alin meteorite is classified as a coarse iron octahedrite type IIB (this type of meteorite displays a beautiful pattern known as a Widmanstatten pattern when sliced and etched). The Sikhote-Alin meteorite fall occured on February 12, 1947. It is the largest observed meteorite fall in recent history, with an estimated mass of more than 60 tons that broke up about 3.5 miles above the earth's surface shortly before impact. This iron meteorite fell to earth through the bright sunlight of late morning, and it was described by observers as being as bright and large as the sun, casting shadows as it passed by and leaving a large plume of smoke in the sky that lasted for hours. Meteorite Dimensions: 1.9" x 1.6" x 0.9"
Meteorite Measurements: 3.4" x 1.4" x 0.7"
This fine quality genuine individual Sikhote-Alin iron meteorite has thumb-prints (also known as regmaglypts; cavities on the meteorite's surface produced by intense heat and ablation as it passed into and through earth's atmosphere). The Sikhote-Alin meteorite is classified as a coarse iron octahedrite type IIB (this type of meteorite displays a beautiful pattern known as a Widmanstatten pattern when sliced and etched). The Sikhote-Alin meteorite fall occured on February 12, 1947. It is the largest observed meteorite fall in recent history, with an estimated mass of more than 60 tons that broke up about 3.5 miles above the earth's surface shortly before impact. This iron meteorite fell to earth through the bright sunlight of late morning, and it was described by observers as being as bright and large as the sun, casting shadows as it passed by and leaving a large plume of smoke in the sky that lasted for hours. Meteorite Dimensions: 4.3" x 3.4" x 1.6"
This genuine Sikhote-Alin iron meteorite has unique natural angular surface features which were exposed when a larger Sikhote Alin meteorite broke apart at or near the surface of the earth. These angular features are evidence of this natural meteorite's internal crystallized structure. The Sikhote-Alin meteorite is classified as a coarse iron octahedrite type IIB (this type of meteorite displays a beautiful pattern known as a Widmanstatten pattern when sliced and etched). The Sikhote-Alin meteorite fall occured on February 12, 1947. It is the largest observed meteorite fall in recent history, with an estimated mass of more than 60 tons that broke up about 3.5 miles above the earth's surface shortly before impact. This iron meteorite fell to earth through the bright sunlight of late morning, and it was described by observers as being as bright and large as the sun, casting shadows as it passed by and leaving a large plume of smoke in the sky that lasted for hours. See also an opposite side view of this natural Sikhote-Alin meteorite. 3.9" x 2.3" x 1.9"
This fine quality genuine individual Sikhote-Alin iron meteorite has thumb-prints (also known as regmaglypts; cavities on the meteorite's surface produced by intense heat and ablation as it passed into and through earth's atmosphere). The Sikhote-Alin meteorite is classified as a coarse iron octahedrite type IIB (this type of meteorite displays a beautiful pattern known as a Widmanstatten pattern when sliced and etched). The Sikhote-Alin meteorite fall occured on February 12, 1947. It is the largest observed meteorite fall in recent history, with an estimated mass of more than 60 tons that broke up about 3.5 miles above the earth's surface shortly before impact. This iron meteorite fell to earth through the bright sunlight of late morning, and it was described by observers as being as bright and large as the sun, casting shadows as it passed by and leaving a large plume of smoke in the sky that lasted for hours. See also an opposite side view of this genuine Sikhote-alin meteorite. 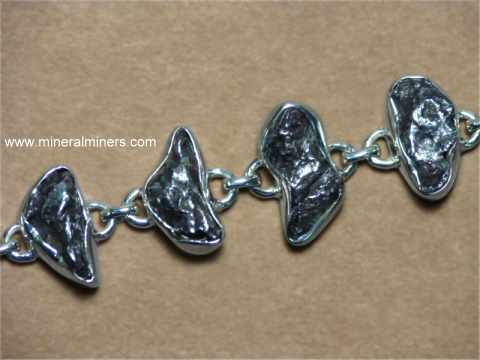 This superior quality Muonionalusta meteorite has a natural surface patina with relatively little corrosion. There is a deep regmaglypt on one side along with some other thumbprints, and there are some crystalized surface areas showing in three different parts of its surface! See a photo showing one of the crystallized areas on this natural Muonionalusta meteorite, and also a photo of another crystallized area of this genuine meteorite. This superior quality individual Muonionalusta meteorite was discovered within the Arctic Circle in Sweden. The Muonionalusta meteorites are classified as fine iron octahedrites, type IVA. This type of meteorite displays a very fine Widmanstatten pattern when its surface is etched. These beautiful patterns formed by very slow crystallization in the vacuum of space from the core material of a planet that exploded billions of years ago! This genuine Nantan meteorite has a relatively flat shape. It is in natural condition and makes a very nice collector specimen just as it is, although it also could be polished or sawn and then etched to show its Widmanstatten octahedral pattern of intergrown crystallized iron and nickel. See also an opposite side view of this natural Nantan meteorite. The Nantan meteorite fall is one of the very rare witnessed iron meteorite falls on Earth. It fell from the northwest in May of 1516 during the reign of Chinese emperor Zhendge, with falling stars as bright as lightning that "waved like snakes & dragons" and then disapeared in a few seconds. Centuries passed with no further record until 1958 during the severe steel shortage of chairman Mao Tsetung's "Great Leap Forward" program when even the local farmer's cooking pots were melted down to produce steel. Some farmers at Nantan then discovered heavy iron rich rocks that they were unable to melt. 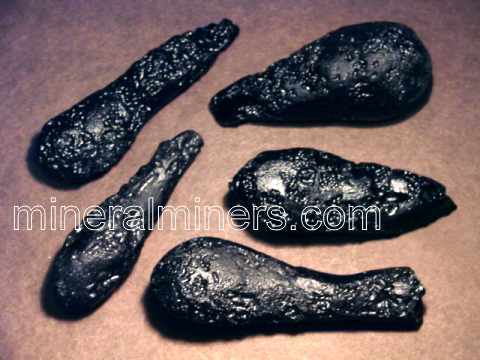 Government investigators arrived and determined the "iron ore" to be meteorites! This genuine Nantan meteorite has a relatively flat shape. It is in natural condition and makes a great collector specimen just as it is, although it also could be sawn and then etched to show its amazing Widmanstatten octahedral pattern of intergrown crystallized iron and nickel. See also an opposite side view of this natural Nantan meteorite. The Nantan meteorite fall is one of the very rare witnessed iron meteorite falls on Earth. It fell from the northwest in May of 1516 during the reign of Chinese emperor Zhendge, with falling stars as bright as lightning that "waved like snakes & dragons" and then disapeared in a few seconds. Centuries passed with no further record until 1958 during the severe steel shortage of chairman Mao Tsetung's "Great Leap Forward" program when even the local farmer's cooking pots were melted down to produce steel. Some farmers at Nantan then discovered heavy iron rich rocks that they were unable to melt. Government investigators arrived and determined the "iron ore" to be meteorites! 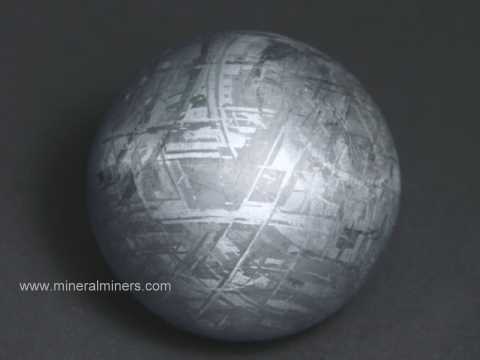 See also our page displaying genuine Meteorite Spheres with etched surfaces showing their amazing widmanstatten patterns! During some meteorite impacts here on earth, it is believed that both the surface of the earth and the meteorite itself melt together and are thrown or splashed into the air by the force of the meteorite impact's explosion, fusing into natural glass tektites which cooled quickly while flying up into the air and then falling back down to the earth. 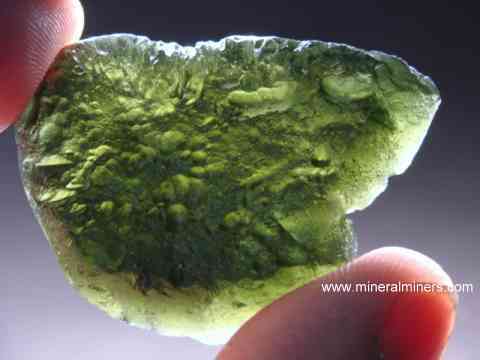 The transparent green Moldavite is a natural silicate glass tektite. 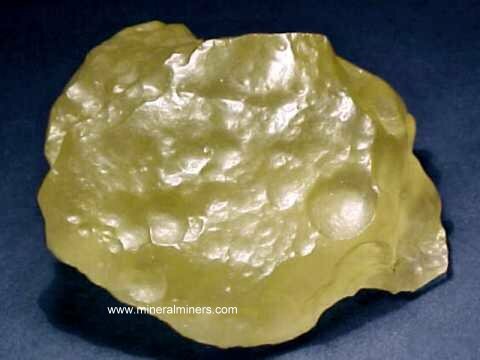 Tektites, including moldavite, are believed by scientists to have formed from the intense heat and extreme pressure produced during a meteorite impact on or near the surface of the earth. See our page displaying genuine moldavite jewelry, with all natural moldavite jewelry designs including beautiful moldavite necklaces and genuine moldavite rings. 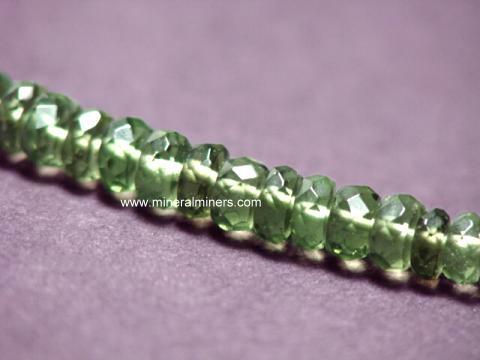 See also our genuine moldavite bracelets. We also have genuine Tektite Jewelry available in rings, pendants and necklaces. Wind blown desert sands sculpt the Libyan desert glass tektites into interesting shapes with a semi-polished natural surface finish. Those who trek to Eastern Egypt's uninhabited regions in search of these Lybian desert glass tektites risk much as the region is one of Earth's most inhospitable places, and finding a medjool date palm oasis is very unlikely! To see more meteorite photos, just select another item category from the table below. We have a variety of shapes and sizes available in natural meteorites from several locations worldwide, and we also have genuine meteorite spheres! 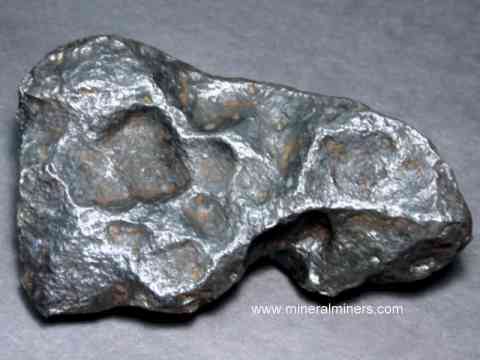 Would you like us to inform you when we add more genuine Sikhote-Alin Meteorites, Gibeon Meteorites, Muonionalusta Meteorites, Nantan Meteorites, and Campo Del Cielo Meteorites on this page? We have additional inventory of natural iron nickel meteorite specimens in stock, so be sure to let us know if you have any meteorite special requests. Please contact our webmaster, regarding iron nickel meteorites or our 'site' geologist with any questions or comments.